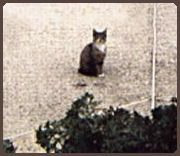 My brother and sister-in-law had been feeding a feral cat who had made the neighborhood its territory. Thinking it was male, they named him Malakai. He would come around fairly regularly for meals. However, in the early Spring of 2004 they began to notice something different about Malakai. It was more than just some weight gain. Could it be that he, errr... SHE was pregnant? 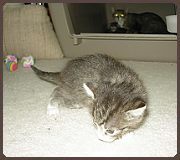 We captured Malakai to have her examined by a vet and kept her in the house to have the kittens in a safe place. She was not tame, and not very happy to be inside. 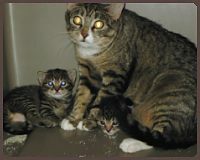 But we felt she was better off and the kittens would have a better chance indoors. We couldn't let her roam the house so we housed her in a large dog crate. In a week or so she gave birth to four darling kittens, two boys and two girls (although we thought one of the girls was a boy for a while). 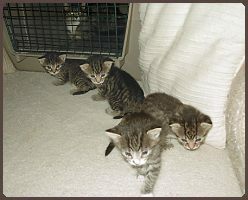 Here they are about one week old: Turner, Whiner, Bugger and Metwo. Those names were based on our initial impressions and the evolved over time. 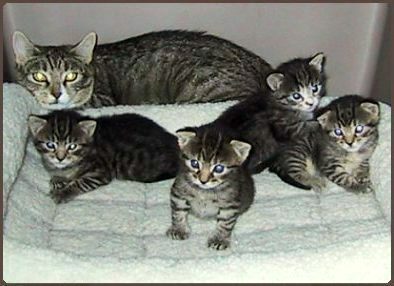 For most of us, me at least, this was the first time having kittens at this early an age, let alone from a feral mom. 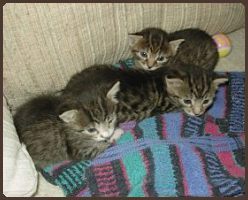 Once the kittens had their eyes open we began holding them and so they would get accustomed to people and hopefully become domesticated. It worked. Malakai, on the other hand, wasn't buying it, but eventually learned to at least tolerate our intrusion. 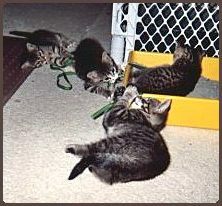 Meanwhile, the kittens began to explore their world. Bugger was the first to venture out on her own. While the others seemed to prefer staying with mom. It was around this time that Bugger began to be known as Lily. It wasn't long before the other Malakettes ventured out to join Lily on her quest. They followed her across the carpetted landscape, over pillows, under tables, around people. Just as they were beginning to wonder why, they found what they were searching for. And along the way Turner's name had morphed into Raja. "We seek the soft towel upon the comfy chair." As they grew and became more active the Malakettes needed better digs. We put up a kitten coral about 2 by 6 feet using some toddler fencing with some plastic screening stretched over a plywood frame for a lid. Inside were all the amenities to make them feel at home; food and water bowls, a litter box, a kitten condo and cat hammock. The hammock is from JaxCats - "purveyor of feline centric art and fine hand-crafted kitty stuff". But ... I digress. The kittens really enjoyed their new "house" and even Malakai seemed at little more at ease. Not only did she have more room, but she could hide under the hammock when she wanted privacy. 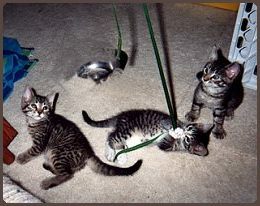 We let the kittens out in the room for some quality play time and they made good use of it. Of course this is part of the kittens' development, and not just for fun. 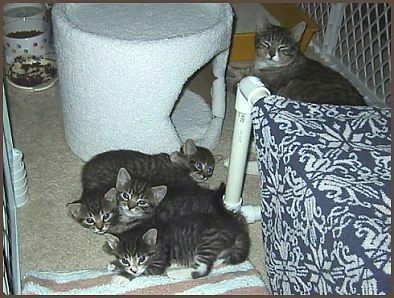 The kittens continued to grow and were truly a joy to have around. More and more their individual personalities became more apparent. Whiner stopped whining all the time and we named him Piper. 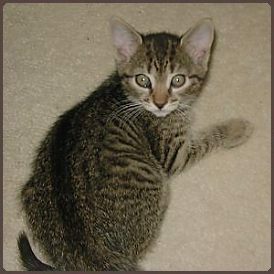 Metwo was still Metwo, but sometimes he was more like "me too". Eventually, the Malakettes were weaned and no longer relied on their mom and Malakai was ready to let her babies go their own way. Malakai was not happy being indoors and we knew she need to return to the wild. We don't know if this was her first litter, but we made sure it was her last. We had her spayed and kept her in the coral for a week while she healed. Then we took her in the dog crate back to where she was captured and let her loose. She is happy again being free, and happier still without going into heat and having kittens to care for. Malakai still comes around regularly for meals and is seen playing and hunting in the yards around the neighborhood. A "friend" of hers also starting coming around for food and shelter. His name is Mento and we think he may be the father of the Malakettes. The Malakettes were all so endearing but we couldn't seriously consider keeping all of them along with the three cats already in residence. 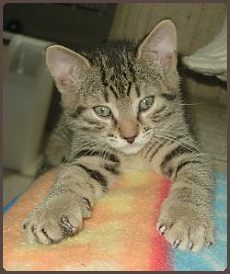 We knew someone who was interested in adopting new kittens and we had a perfect match in Lily and Metwo. We know they are in a happy home. 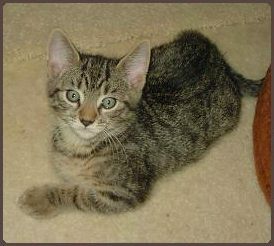 Raja, or Rah for short, and Piper did stay with us, joining Pumpkin Pie, Jon Li and Meisha. They've grown a lot in a year. They remain indoor cats. 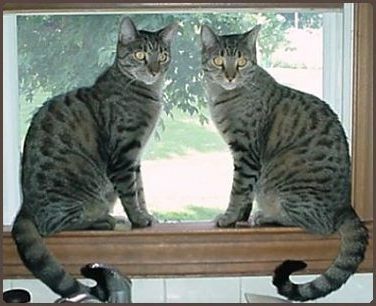 One of their favorite spots is sitting in the kitchen window watching what goes on out there in "the big room". 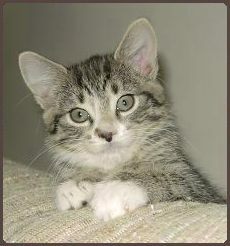 Jon Li loved playing with the kittens and seems willing to share the territory as they grow. Meisha is not so sure about the newcomers. She's very shy to begin with but seems to be tolerating the company. Pumpkin Pie just pretends there's nothing new and is content to remain a loner. Back to Thai Chat's and Mingus' Page. Back to Meisha's and JonLi's Page). Back to Floyd's home page. No animals were harmed in the creation of this WEB page.